It would take the 1861-1865 Civil War and the religious civil rights movement of the 1960s to fully effect our Christian culture. Abraham Lincoln held to the literal reading of the Declaration of Independence, that all men are created equal. As expressed in his 1863 Gettysburg Address during the Civil War, this Nation under God brought forth a new birth of freedom, as evidenced by the passage of Amendments 13-15 following the War. The Fourteenth Amendment of the Constitution is considered the most significant since the Bill of Rights. Originally the Bill of Rights was a set of restrictions on the powers of the Federal Government, but not the States. Over time, the Supreme Court has interpreted the Fourteenth Amendment to apply most of the guarantees of the Bill of Rights to the States as well as the Federal Government. The Bill of Rights gradually has become available to all American citizens, for it provided equal protection to everyone, and limited the power of the States to deny life, liberty, or property without due process of the law. This is reflected in our Pledge of Allegiance to the Flag of the United States of America, "one Nation under God, indivisible, with Liberty and Justice for all." "The Conventions of a number of the States having at the time of their adopting the Constitution, expressed a desire, in order to prevent misconstruction or abuse of its powers, that further declaratory and restrictive clauses should be added: And as extending the ground of public confidence in the Government, will best insure the beneficent ends of its institution. ARTICLES in addition to, and Amendment of the Constitution of the United States of America, proposed by Congress, and ratified by the Legislatures of the several States, pursuant to the fifth Article of the original Constitution." 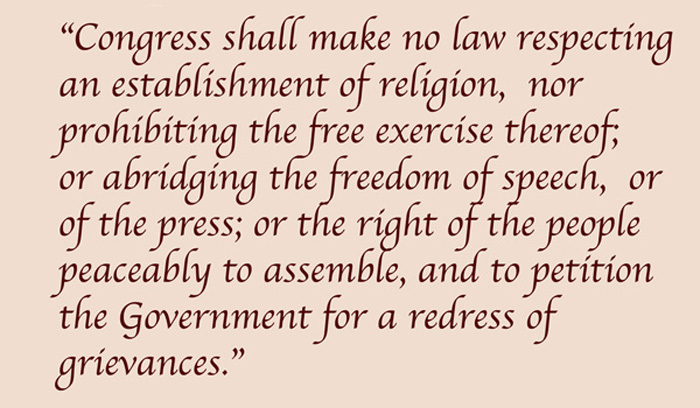 The First Amendment guarantees the basic rights of an individual: freedom of religion, freedom of speech, freedom of the press, freedom to peacably assemble, and the right to petition the government for a redress of grievances. The free exercise of religion has been called an American invention; it was the belief of James Madison that freedom of religion would provide a "lustre to our country." Roger Williams of Rhode Island, a Christian preacher, was the first to address freedom of conscience in his book the Bloody Tenent of Persecution. Maryland was the first colony to enact a Toleration Act for all Christians in 1649. Rhode Island in their Charter of 1663 was the first colony to enact freedom of conscience and religion for Protestants. The Anglican Church was the established Church in Colonial Virginia, and Evangelicals, particularly Presbyterians and Baptists, were persecuted. George Mason, a dedicated proponent of freedom of religion, was the chief architect of the Virginia Declaration of Rights, which passed unanimously at the Virginia Convention on June 12, 1776. Thomas Jefferson had written the Virginia Statute for Establishing Religious Freedom in 1779, but this was tabled by the prevailing Anglican assembly. In reaction to a bill to assess every Virginia citizen to support Anglican teachers, James Madison wrote his Memorial and Remonstrance against Religious Assessment (1785), where he states "We maintain therefore that in matters of Religion, no man's right is abridged by the institution of Civil Society, and that Religion is wholly exempt from its cognizance." This led to the passage of Jefferson's Statute in 1786. While Separation of Church and State was necessary at the time to allow other Christian faiths to prosper, Jefferson and Madison supported a vibrant public square for religion. School prayer and Bible readings existed in public schools and public events for over 300 years in our nation! The First Amendment allows the Free Exercise of Religion. The Massachusetts signers of the Declaration of Independence, such as Samuel Adams, John Hancock, John Adams, and Elbridge Gerry, saw the right to bear arms our best defense against tyranny, as evidenced by our victory at Lexington and Concord! The Greek philosopher Aristotle said that decisions of a leader backed by a standing army would be different than those made by a leader "awed by the fear of an armed people." The right of individuals bearing arms is ever more important today in the face of growing lawlessness and terrorism in the world. England secured their own liberties with the Magna Carta of 1215, the Petition of Right of 1628, and their own Bill of Rights in 1689, but violated our freedom by passage of the despised Quartering Acts of 1765 and 1774, which placed British troops in Boston, violating the sanctity of private property. The Third Amendment is important and has been cited by courts as evidence that the Constitution created a general right of privacy for individuals, to protect them from government intrusion into their personal affairs. and particularly describing the place to be searched, and the persons or things to be seized. A man's home is his castle. This principle of law was first stated by Cicero in Roman times. Throughout history, champions of human rights saw the right of individuals to acquire and hold property because it secured life and liberty as well. The prohibition against illegal searches of home and property goes back to the 1215 Magna Carta of England, the first Charter of Liberty in the Western world. In general, police, before they search anyone's property, must go to the courts to obtain a warrant, which is granted on probable cause of finding evidence of a crime. The Fourth Amendment also protects against arbitrary arrest. In Wilkes v Wood, 1763, the illegal search of an individual's home without due cause or by a nameless warrant was likened to the Spanish Inquisition! The Fifth Amendment provides fair methods for trying people accused of committing a crime. The Fifth and Sixth amendments support the Writ of Habeas Corpus clause of the Constitution (Article I, Section 9, Clause 2). Habeas Corpus is Latin for "let us produce the body" and is a legal requirement that those arrested for a crime cannot be detained for a lengthy period without judicial proceedings. The right to due process of law of the Fifth Amendment protects those accused of crimes from being imprisoned without fair procedures. A widely known provision of the Amendment is the clause that prohibits self-incrimination, or the right to remain silent. The Fifth Amendment also prohibits double jeopardy, that a person may be not tried twice for the same crime. The concept of eminent domain is also expressed here, allowing the government, with just compensation to the owner, to acquire private property when there may be overall benefit to the public, such as building an important highway. to have compulsory process for obtaining witnesses in his favor, and to have the Assistance of Counsel for his defence. The Framers of the Constitution considered the sixth through eighth amendments among the most important. Experience had shown, as the trial in England of the Quaker William Penn, the founder of Pennsylvania, that the greatest potential for tyranny lay in the government's administration of the law. The right to a speedy and public trial by an impartial jury is critical to justice. Without a speedy trial, criminal defendants could be held indefinitely, under a cloud of unproven accusations, or witnesses may die or their memories fade, or physical evidence may be lost. The public trial safeguards defendants from secret proceedings that may encourage abuse of the judicial system. The defendant is also guaranteed the right to an attorney and to face their accusers. The Seventh Amendment guarantees a jury trial in common law, that one has the right to have a case decided by a jury of their peers. In addition, the Amendment highlights the jury's role as "fact-finder," and limits the role of the judge to override the jury's conclusions. Under common law, the jury hears the facts and decides the verdict, and the judge sets the penalty based on the jury's findings. The Eighth Amendment guarantees that bail not be excessive, set so high that only the rich can afford it. Bail is returned to the defendant when the party appears at trial. The better-known provision of cruel and unusual punishment was originally intended to outlaw ruthless methods of punishment such as torture, but this has been broadened to protect against punishments too harsh for a particular crime. Challenges against the death penalty arise from the Eighth Amendment. The Ninth Amendment offers a constitutional safety net, that Americans have other fundamental rights beyond the above listed. Along with the First, Third, and Fourth Amendments, the Ninth Amendment supports a constitutional right to privacy. The Tenth Amendment was included to preserve the balance of power between the states and the federal government, and further acknowledges the basic political principle that all power belongs to the people. Only those powers delegated by the people may be exercised by the government - either federal or state. The Bill of Rights thus ends as our Constitution began - affirming the sovereign power of "We, the People". 1 Burger WE, Atherton HM, Barlow JJ. The Bill of Rights and Beyond. Warren Burger and The Commission on the Bicentennial of the United States Constitution, Library of Congress, Washington, D. C, 1991. 2 Alexander Hamilton, James Madison, John Jay. The Federalist, 1787-1788. Jacob Gideon, Publisher, Washington, D. C., 1818. 3 Noonan JT. 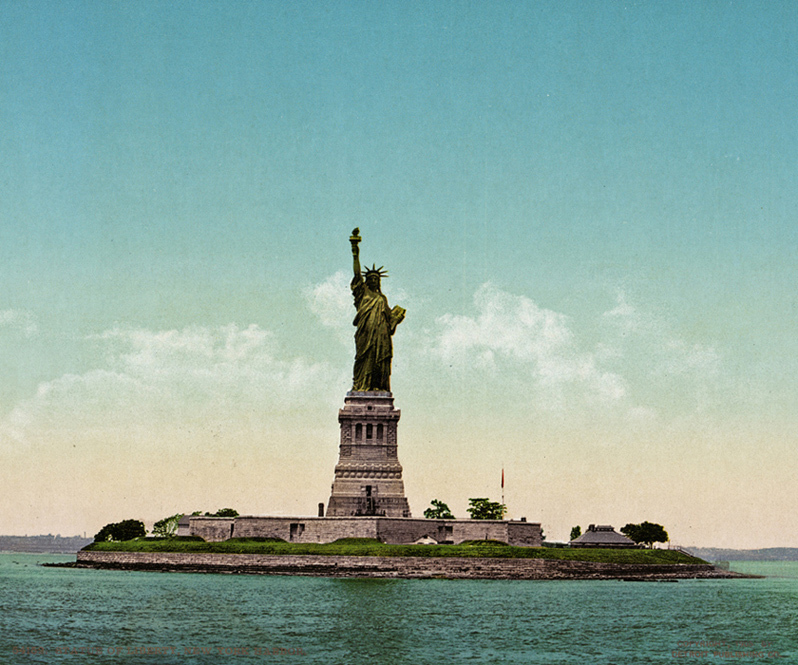 The Lustre of Our Country: The American Experience of Religious Freedom. University of California Press, Berkeley, California, 1998. 4 Ritchie DA. Our Constitution. Oxford University Press, New York, 2006. 5 Spalding M. We Still Hold These Truths. Intercollegiate Studies Institute, Wilmington, Delaware, 2009. 6 Meese E, Spalding M, Forte D, Editors. The Heritage Guide to the Constitution. Regnery Publishing, Washington, D. C., 2005. 7 Ellis JJ. Founding Brothers. AA Knopf, New York, 81-119, 2000. 8 Patrick JJ. The Bill of Rights: A History in Documents. Oxford University Press, New York, 2003. 9 Haynes CC, Chaltain S, Glisson SM. First Freedoms. Oxford University Press, New York, 2006. 10 Berkin C, Miller CL, Cherny RW, Gormly JL. Making America. Fourth Edition, Houghton Mifflin, Boston, 2006. 11 Hutson JH. Church and State in America: The First Two Centuries. Cambridge University Press, 2008. 12 Mark A. Noll. America's God: From Jonathan Edwards to Abraham Lincoln. Oxford University Press, 2002. 13 Ragosta J. Religious Freedom: Jefferson's Legacy, America's Creed. University of Virginia Press, Charlottesville, 2013. 14 Bennett WJ. America - The Last Best Hope, Volume I. Thomas Nelson, Nashville, Tennessee, 2006.